It’s that time of year again. 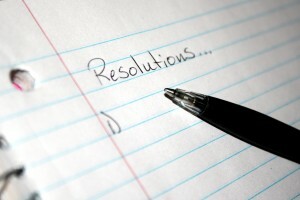 Time to think, plan and implement your New Year’s Resolution. Here are 8 tips to help jump start your health related resolution. If you want to lose weight, don’t jump on that new fad diet to try and lose 20 pounds in 2 weeks. A good weight loss goal is 1-2 pounds per week. Try to get 30 minutes of exercise at least 5 days per week. This is the recommended amount by the American College of Sports Medicine (ACSM). This can include going for a walk, riding a bike, running or jogging, playing a sport like tennis or basketball. Find something that you enjoy doing and carve out 30 minutes of your day to get out and move. Remember that 1-2 pounds per week goal we set earlier? This is a great place to start. One pound of fat is equal to 3500 calories. So if you can lower your net caloric intake by 500 calories per day then you would lose 3500 calories per week, or 1 whole pound of fat. By replacing those 2 cans of soda with a couple glasses of water you’ve already eliminated over 250 calories from your diet daily. By lifting weights or performing some sort of resistance training (body weight exercises, resistance bands, weight machines) just 2 days per week, you can increase your lean muscle mass and promote bone health. Not only does resistance training lead to more lean muscle, it increases your resting metabolism which can help you burn more calories during the day. This doesn’t apply only to men, women can see the same benefits while also helping promote bone health and fighting osteoporosis. And don’t worry women, you don’t have to worry about getting too big or bulky from resistance training, this is a common myth. It’s a lot harder than you think to develop a “body builder” type of body. A few days per week of resistance training will help tone your body and improve strength. Snacking is not the cause of unwanted weight gain. In fact eating small meals 5-6 times per day can help promote a healthy weight by keeping your metabolism steady throughout the day and by fighting those cravings for sugary snacks. So instead of reaching for a bag of chips or cookies, try cut up veggies with hummus, or an apple. This can be a tough adjustment at first, but will prove to be very beneficial in the long run. Time restrictions are often the reason people claim they don’t exercise and don’t eat right. By planning your meals for the week ahead of time you can avoid that last minute stop to your favorite fast food restaurant. Try cooking your meals for the week over the weekend so you have healthy food choices available to you when you get home from work or after you finish your workout. Not sure where to start? There are plenty of resources out there to help you reach your goals. It’s okay if you aren’t sure which foods are best to eat during the day, and before or after your workout. Creating a good exercise program can also be a daunting task if you’ve never exercised before. Take some time to read up on good workout programs for beginners or even for those advanced athletes who need new ideas. You can always reach out to your local physical therapist, personal trainer or dietitian to help with these decisions as well. Lastly, but Most Important, Commit to a Lifestyle Change, Not a Diet. Diet’s come and go, and most of the time when someone starts a diet, the weight comes and goes as well. It’s hard to maintain a healthy weight or a healthy lifestyle when you go from one extreme to another. In order to live a healthy lifestyle it’s important to make a commitment that this change is for the long term, not the short. If you’ve never exercised before, don’t force yourself to train for 2 hours per day, you are likely going to burn yourself out and stop exercising altogether. Try different modes of exercise and see what you like best. Maybe you like running, or yoga. Maybe your thing is a group exercise class. If you love Chinese food, try and learn how to make some of your favorite dishes at home with a healthy twist. For instance grilling the chicken instead of breading and frying it. The internet has loads of healthy recipes and you can find ways to make healthy and nutritious foods taste really good. Follow these tips and you will be on the path to a successful New Year’s Resolution. If you have any tips on what’s worked for you or recipes you’d like to share please share your thoughts by using our comments section.